Looking for an easy way to plan a bathroom remodel? Try an easy-to-use online bathroom planner like RoomSketcher. Create bathroom layouts and floor plans, try different fixtures and finishes, and see your bathroom design ideas in 3D! Whether you are planning a new bathroom, a bathroom remodel, or just a quick refresh, RoomSketcher makes it easy for you to create a bathroom design. Unlike other bathroom planners, no CAD experience is necessary so you can get to work on your bathroom design straight away with this easy-to-use bathroom planner. Planning a bathroom can be challenging. The space is often small, but packed with functional requirements. There are a lot of great bathroom planning ideas out there, but it is hard to know which will work in your bathroom. One of the best ways to figure that out is with an online bathroom planner. The RoomSketcher app is an easy-to-use floor plan and home design tool that you can use as a bathroom planner to plan and visualize your bathroom design. Create a floor plan, try different layouts, and see how different materials, fixtures, and storage solutions will look. 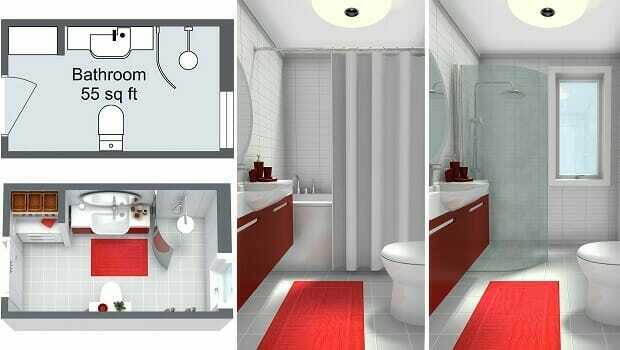 Create your bathroom design using the RoomSketcher app on your computer or tablet. Draw your floor plan, choose your furnishings, and see your bathroom design in 3D – it’s that easy! Draw a floor plan of your bathroom in minutes using simple drag and drop drawing tools. Simply click and drag your cursor to draw or move walls. Select windows and doors from the product library and just drag them into place. Built-in measurement tools make it easy to create an accurate floor plan. Select bathroom vanities, cabinets, fixtures, and more and simply drag them into place. Resize items easily, experiment with different finishes, and save your favorite design options to review and compare. Use the camera to take instant Snapshots of your bathroom design in 3D. Use our interactive Live 3D walkthrough feature to view your design as if your actually there. When your design is ready, create high-quality 3D Floor Plans, 3D Photos, and 360 Views to show your ideas. 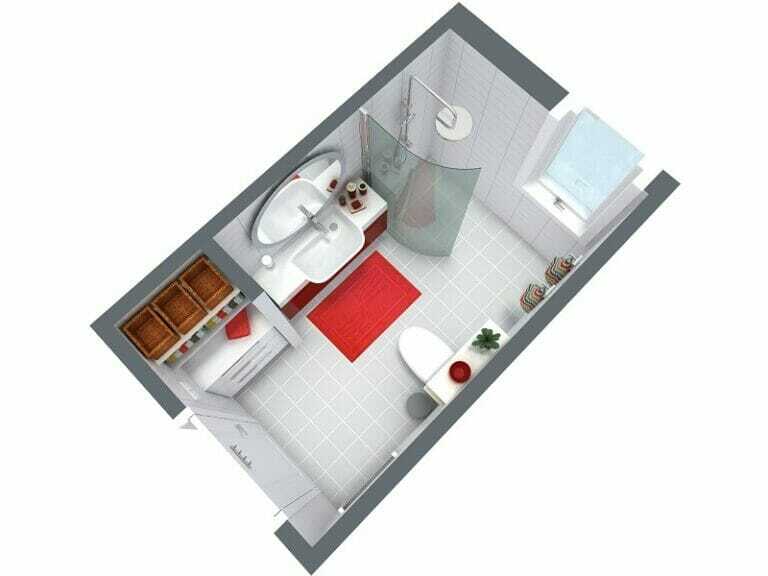 2D Floor Plans are essential for bathroom planning. They help you to layout your bathroom correctly, to know what will fit, and to get more accurate estimates. Show measurements, the room size in square meters and feet, the locations of bath fixtures, and more. 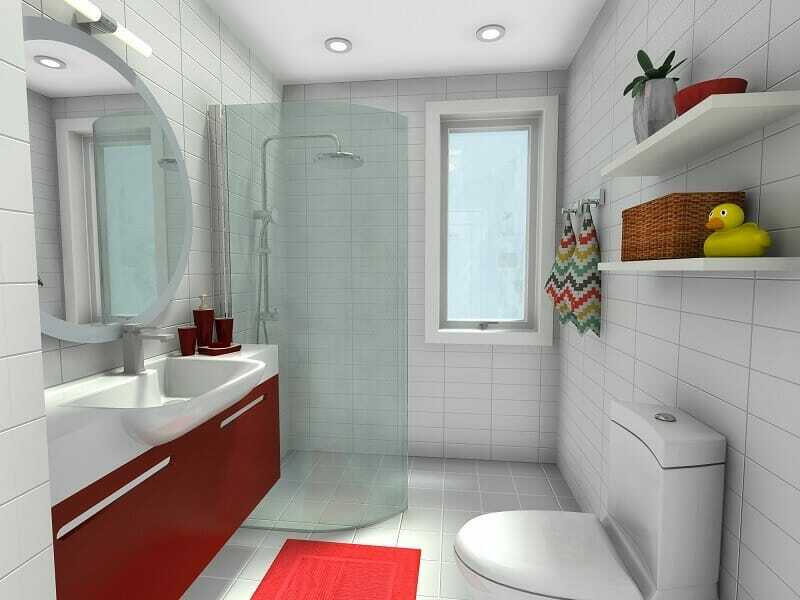 With RoomSketcher, you can create a 3D Floor Plan of your bathroom at the click of a button! 3D Floor Plans are ideal for bathroom planning because they help you to visualize your whole room including the cabinetry, fixtures, materials and more. Create high-quality 3D Photos of your bathroom design from your camera Snapshots. See how your new bathroom will look including colors, textures, and materials. They are the perfect way to see and share your design ideas! Create stunning 360 Views of your bathroom design instantly. View the entire room as if you are standing right there! With RoomSketcher, every user can access many of our features for free so that you can start planning your bathroom straight away. Just draw your floor plan, furnish and decorate it, and see your design in 3D – it’s that easy! For more powerful features, such as stunning 3D Photos, high-resolution 2D and 3D Floor Plans, and Live 3D walkthroughs – simply upgrade to a VIP or Pro subscription at any time. Get started on your bathroom today with this easy-to-use bathroom planner!